Modified from: Ingle, S. & M.F. Coffin, Impact origin for the Ontong Java Plateau, Earth Planet. Sci. Lett., 218, 123-134, 2004. The main features of the greater Ontong Java Plateau (OJP) may be summarized as follows. It formed at ~120 Ma (Aptian time, Early Cretaceous) (Figure 1) (Mahoney et al., 1993). It is presently obducting along the Solomon Islands trench (Figure 2) (e.g., Neal et al., 1997). It includes the Ontong Java Plateau and neighboring basin basalts, including Nauru, E. Mariana, possibly Pigafetta and other contemporaneous flood basalts (Coffin & Eldholm, 2004). It is the most voluminous large igneous province (LIP) on Earth, at ~ 60 million cubic km (Gladczenko et al., 1997). It is areally extensive, covering ~ 0.8% of the total surface area of the Earth (Coffin & Eldholm, 1994). It is structurally homogeneous – there is no evidence of continental lithosphere (Phinney et al., 1999). Except for the obducting margin, it is presently in isostatic equilibrium with the seafloor (Figure 3) (Gladczenko et al., 1997; Ito & Taira, 2000). It is geochemically homogeneous, involving large degrees (> 30%) of batch partial melting followed by extensive fractional crystallization (e.g., Neal et al., 1997). It is widely believed to have been formed by a large mantle plume head (e.g., Tarduno et al., 1991). Figure 1: Plate tectonic reconstruction for Ontong Java Plateau (OJP), Nauru (NAU), East Mariana (MAR), Pigafetta (PIG) basin flood basalts and Manihiki Plateau (MAN) (118.7 Ma – Chron M0: after Eldholm & Coffin, 2000). 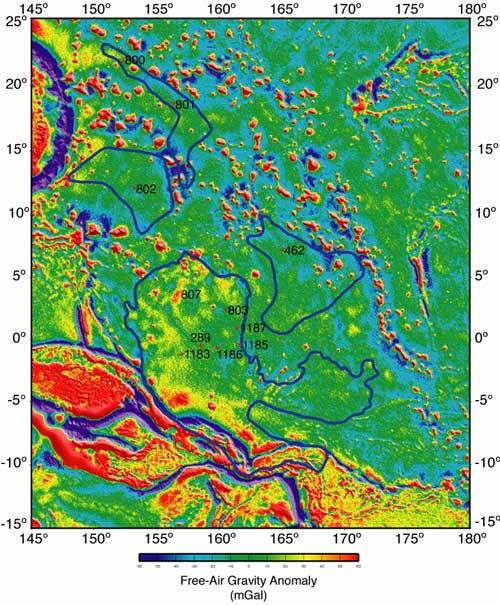 Figure 2: Predicted bathymetry with drill sites that penetrated flood basalts superimposed (Smith & Sandwell, 1997). Click on figure for enlargement. Figure 3: Satellite-derived free-air gravity field with same drill sites as Figure 2 superimposed (Sandwell & Smith, 1997). Click on figure for enlargement. Widespread subaerial volcanism is predicted to be caused by the arrival of hot, buoyant ascending plume material at the base of the oceanic lithosphere (Griffiths et al., 1989; Farnetani & Richards, 1994; Ito & Clift, 1998). Uplift of the seafloor from 1000 m to 2000 m is predicted due to the arrival of a 1000-2000-km-diameter plume head (Griffiths et al., 1989). Uplift of the seafloor from 3000 m to 4000 m is predicted based on OJP-specific dynamic plume models (Farnetani & Richards, 1994). Uplift of the seafloor from 1000 m to 3000 m is predicted based on OJP-specific isostatic plume models (Ito & Clift, 1998). Observation: Actual uplift depends on the model chosen, but it is obvious from the data that uplift of the oceanic crust falls far short of predictions, regardless of the wide range for predicted uplift models (Figure 4). Figure 4: Model-predicted paleodepth ranges for the top of OJP crust (open symbols) compared to actual paleodepth ranges (filled symbols) of Aptian sediments overlying the crust for DSDP and ODP sites. The error bars for all data give the range based on minimum and maximum estimates (predicted) or calculations (actual). See Ingle & Coffin (2004) for details. According to simple isostasy, emplacement of the 35-km-thick crust of the OJP following uplift of the preexisting ~ 7-km-thick oceanic crust, should have resulted in a minimum culminating elevation of ~ 700 – 4200 m on the crest of the OJP (Ingle & Coffin, 2004). Significant subaerial volcanism should have been widespread. Most oceanic plateaus, submarine ridges, and seamount chains have experienced subaerial volcanism during construction (Detrick et al., 1977; Coffin, 1992). Observation: All sampled OJP basalts, both drilled & obducted, were erupted well below sea level (Figure 5). Figure 5: Mass fluxes and peak eruption levels of currently active hot spots and the OJP. Note that of all the hot spots, only Iceland coincides with a mid-ocean ridge. For the OJP, the error bars represent the mass flux range assuming an emplacement duration of 1 - 5 Myr. Plateaus within oceanic lithosphere should subside as a result of thermal conduction (Detrick & Crough, 1978) or continuous viscous spreading of the anomalous mantle material (Richards et al., 1989) (Figure 6). Observation: Based on paleoenvironments interpreted from sediment overlying basalt (Andrews et al., 1975; Sliter & Leckie, 1993) and basalt eruption depths calculated from water and carbon dioxide concentrations in basaltic glasses (Roberge et al., 2003) it appears that the OJP crust subsided only 1000 – 2800 m (Ingle & Coffin, 2004) (Figure 6). Figure 6: Total subsidence vs. age for Ontong Java Plateau basalts (error bars on symbols denote range) compared to lithospheric subsidence curves from: BL and PS77 (Parsons & Sclater, 1977) and SS92 (Stein & Stein, 1992). the OJP was originally proposed to have been created by the Louisville hot spot (e.g., Tarduno et al., 1991). An “enriched” mantle source, preferably isotopically comparable to one of the mantle endmembers (e.g., EMI, EMII, HIMU). Large degrees of melting – melting at a plume-ridge intersection or a “wet” plume. High concentrations of elements or element isotope ratios that reflect a possible core input (Neal et al., 1997). Noble gas data that reflect a primitive mantle source, typically associated with the lower mantle. Observation: Geochemical data are ambiguous in their support for a mantle plume origin. Isotopic compositions are intermediate between primitive mantle and “mid-ocean ridge” or “depleted” upper mantle compositions (e.g., Tejada et al., 2002). Platinum group element concentrations are high relative to predicted values (Ely & Neal, 2003). OJP basalts suggest low-water contents in their mantle source (Michael, 1999) ruling out a “wet” plume. Observation: The root appears to be rheologically strong and not related to a thermal anomaly. Its volume is far too large to be explained by mantle material remaining after extracting the volume needed to form the OJP basalts. In summary many geophysical, geodynamic, and geochemical results from the greater OJP are at odds with various mantle plume models for its origin. As discussed below, we suggest that an extraterrestrial impact model is much more consistent with existing data and results. Would the impact of a large meteorite explain better the observations for the greater OJP as has been suggested for the Siberian Traps (Jones et al., 2002)? ~20 km diameter bolide of chondritic composition. Vertical impact assumed and instantaneous vaporization of the ~ 4 km deep water column. Preexisting lithosphere thickness of ~50 km. Penetration depth of ~ 60 km (O’Keefe & Ahrens, 1993) and initial crater diameter of ~ 200 km (Grieve & Pesonen, 1992) (Figure 7). Massive decompression melting in the upper mantle, to a minimum depth of 300 km, assuming 100% partial melting. This results from the removal of the lithospheric overburden. 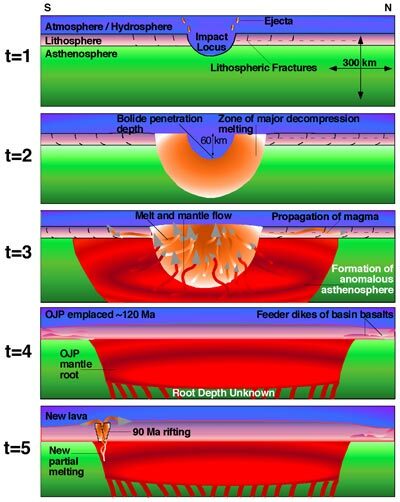 Solid asthenospheric mantle, moving laterally inward and upward from below to replace the extracted mantle may have experienced a catastrophic decrease in pressure during its emplacement beneath the OJP, resulting in the low shear-wave velocities observed by Richardson et al. (2000). Figure 7: Conceptual model showing possible sequence of events if a ~20 km-diameter bolide caused the creation of the OJP, from the model of Jones et al. (2002; see also Impacts page). t=1: Moment of impact, water column is vaporized, 20-Myr-old oceanic lithosphere (pink layer) at impact site is obliterated, uppermost asthenosphere is penetrated, and surrounding lithosphere fractures; t=2: Moment of maximum penetration, the crater is completely formed and the melting region becomes focused; t=3: Infill of void from bottom and sides, melt migrates out along fractures in lithosphere, refractory surrounding mantle fills space vacated by outflowing magmas; t=4: ~120 Ma, the OJP at the end of emplacement (pink layer represents ~35 km thick crust); t=5: ~90 Ma, tectonism causing new pressure release melting. Scale is maintained throughout the diagram. Quantitative modeling of the impact event, including evolution of the crater morphology, melt volumes and compositions induced by the impact, emplacement of the melt and OJP uplift and subsidence are critical to validate the model. Spherules and highly-siderophile element anomalies might be present in contemporaneous, local sediments. At the time of writing, such evidence has not been looked for. Discovery of distal sediments of Aptian age including spherules, tsunamis deposits and disturbed abyssal sediments, would help to validate this model. Tektites from the impact site would be unlikely to survive as shocked mafic minerals are significantly less stable than shocked felsic minerals, e.g., quartz. Onset of the Cretaceous normal magnetic polarity superchron (Tarduno et al., 1991). The Selli oceanic anoxic event (Larson & Erba, 1999). Significant marine faunal extinctions (Sepkoski, 1989; 1990). A worldwide radiogenic Sr isotopic excursion in marine sediments that suggests a rapid change from terrigenous-dominated values to mantle-dominated values (Jones & Jenkyns, 2001). Obvious terrestrial evidence for an impact of this magnitude at ~120 Ma is lacking, e.g., no major land faunal extinctions are known to have ocurred. Possible explanations might be the large distance between the impact site and any land mass (Figure 1). The environment of emplacement might also have played a role. This was deep marine, compared with shallow sediments at the Chicxulub site. It may seem logical to anticipate normal, Pacific mid-ocean-ridge-like basalts in the impact scenario (for more extensive discussion of this, see the Ontong Java page) but the isotopic ratios in basalts of the OJP are more typical of ocean islands. However, there are now compelling arguments that suggest that the upper mantle is not as homogeneous as once believed to be (e.g., Anderson, 2001; Meibom & Anderson, 2003; see also Mantle reservoirs page and He-Os page). Considering the volume of the OJP requires melting to at least 300 km depth in the mantle and large extents of melting, many local heterogeneities could have been tapped and mixed in with the depleted matrix to explain the geochemistry of OJP basalts. 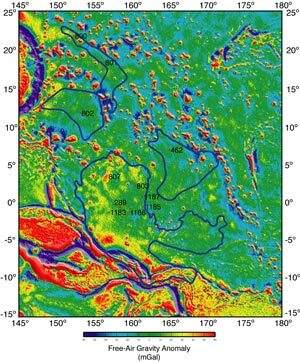 The absence of recognized impact craters on Earth’s deep ocean floor is remarkable considering that estimates based on the present-day terrestrial cratering rate predict that up to three bolides ~10 km in diameter should have struck the deep ocean basins in post-Jurassic times (Proveda et al., 1989). The OJP and the neighboring ocean basin flood basalts may be the evidence of one such impact. D.L. Anderson, A statistical test of the two reservoir model for helium isotopes. Earth Planet. Sci. Lett. 193 (2001) 77-82. J.E. Andrews, G. Packham, et al., (Eds. ), Deep Sea Drill. Progr. Initial Reports 30, U.S. Government Printing Office, Washington, D.C., 1975. M. Antretter, P. Riisager, S. Hall, X. Zhao, B. Steinberger, Modeled palaeolatitudes for the Louisville hotspot and the Ontong Java Plateau, In: Fitton, Mahoney, Wallace, Saunders (Eds.) Origin and Evolution of the Ontong Java Plateau, Geol. Soc. London, in press. P.R. Castillo, R.L. Carlson, R. Batiza, Origin of Nauru Basin igneous complex: Sr, Nd and Pb isotope and REE constraints, Earth Planet. Sci. Lett. 103 (1991) 200-213. P.R. Castillo, P.A. Floyd, C. France-Lanord, Isotope geochemistry of Leg 129 basalts: implications for the origin of the widespread Cretaceous volcanic event in the Pacific, in: R.L. Larson, Y. Lancelot, et al. (Eds. ), Proc. ODP Sci. Results 129 (1992) 405-413. P.R. Castillo, M.S. Pringle, R.W. Carlson, East Mariana Basin tholeiites: Cretaceous intraplate basalts or rift basalts related to the Ontong Java plume?, Earth Planet. Sci. Lett. 123 (1994) 139-154. M.F. Coffin, Emplacement and subsidence of Indian Ocean plateaus and submarine ridges, in: R.A. Duncan, D.K. Rea, R.B. Kidd, U. von Rad, J.K. Weissel (Eds. ), Synthesis of Results from Scientific Drilling in the Indian Ocean, Geophys. Monogr. 70, AGU, Washington, D.C., 1992, pp. 115-125. M.F. Coffin, O. Eldholm, Large igneous provinces: crustal structure, dimensions, and external consequences, Rev. Geophys. 32 (1994) 1-36. R.S. Detrick, J.G. Sclater, J. Thiede, The subsidence of aseismic ridges, Earth Planet. Sci. Lett. 34 (1977) 185-196. R.S. Detrick, S.T. Crough, Island subsidence, hot spots, and lithospheric thinning, J. Geophys. Res. 83 (1978) 1236-1244. O. Eldholm, M.F. Coffin, Large igneous provinces and plate tectonics, in: M.A. Richards, R.G. Gordon, R.D. van der Hilst, (Eds. ), The History and Dynamics of Global Plate Motions, Geophys. Monogr. 121, AGU, Washington, D.C., 2000, pp. 309-326. J.C. Ely, C.R. Neal, Using platinum group elements to investigate the origin of the Ontong Java Plateau, SW Pacific Ocean, Chem. Geol. 196 (2003) 235-257. C.G. Farnetani, M.A. Richards, Numerical investigations of the mantle plume initiation model for flood basalt events, J. Geophys. Res. 99 (1994) 13,813-13,833. T.P. Gladczenko, M.F. Coffin, O. Eldholm, Crustal structure of the Ontong Java Plateau: modeling of new gravity and existing seismic data, J. Geophys. Res. 102 (1997) 22,711-22,729. R.A.F. Grieve, L.J. Pesonen, The terrestrial impact cratering record, Tectonophysics 216 (1992) 1-30. R.W. Griffiths, M. Gurnis, G. Eitelberg, Holographic measurements of surface topography in laboratory models of mantle hotspots, Geophys. J. 96 (1989) 477-495. B.M. Gomer, E.A. Okal, Multiple-ScS probing of the Ontong-Java Plateau, Phys. Earth Planet. Sci. Int. 138 (2003) 317-331. S. Ingle, M.F. Coffin, Impact origin for the greater Ontong Java Plateau? Earth Planet. Sci. Lett. 218 (2004) 123-134. G. Ito, P.D. Clift, Subsidence and growth of Pacific Cretaceous plateaus, Earth Planet. Sci. Lett. 161 (1998) 85-100. G. Ito, A. Taira, Compensation of the Ontong Java Plateau by surface and subsurface loading, J. Geophys. Res. 105 (2000) 11,171-11,183. A.P. Jones, G.D. Price, N.J. Price, P.S. DeCarli, R.A. Clegg, Impact induced melting and the development of large igneous provinces, Earth Planet. Sci. Lett. 202 (2002) 551-561. C.E. Jones, H.C. Jenkyns, Seawater strontium isotopes, oceanic anoxic events, and seafloor hydrothermal activity in the Jurassic and Cretaceous, Am. J. Sci. 301 (2001) 112-149. E.R. Klosko, R.M. Russo, E.A. Okal, W.P. Richardson, Evidence for a rheologically strong chemical mantle root beneath the Ontong-Java Plateau, Earth Planet. Sci. Lett. 186 (2001) 347-361. R.L. Larson, E. Erba, Onset of the mid-Cretaceous greenhouse in the Barremian – Aptian: igneous events and the biological, sedimentary, and geochemical responses, Paleoceanography 14 (1999) 663-678. J.J. Mahoney, M. Storey, R.A. Duncan, K.J. Spencer, M.S. Pringle, Geochemistry and age of the Ontong Java Plateau, in: M.S. Pringle, W.W. Sager, W. Sliter, S. Stein, (Eds. ), The Mesozoic Pacific. Geology, Tectonics, and Volcanism, Geophys. Monogr. 77, AGU, Washington, D.C., 1993, pp. 233-261. A. Meibom, D.L. Anderson, The statistical upper mantle assemblage. Earth Planet. Sci. Lett. 217 (2003) 123-139. P.J. Michael, Implications for magmatic processes at Ontong Java Plateau from volatile and major element contents of Cretaceous basalt glasses, Geochem. Geophys. Geosyst. 1 (1999) doi:1999GC000025. C.R. Neal, J.J. Mahoney, L.W. Kroenke, R.A. Duncan, M.G. Petterson, The Ontong Java Plateau, in: J. Mahoney, M.F. Coffin (Eds. ), Large Igneous Provinces: Continental, Oceanic, and Planetary Flood Volcanism, Geophys. Monogr. 100, AGU, Washington, D.C., 1997, pp. 183-216. J.D. O'Keefe, T.J. Ahrens, Planetary cratering mechanics, J. Geophys. Res. 98 (E9) (1993) 17,011-17,028. B. Parsons, J.G. Sclater, An analysis of the variation of ocean floor bathymetry and heat flow with age, J. Geophys. Res. 82 (1977) 803-827. E.J. Phinney, P. Mann, M.F. Coffin, T.H. 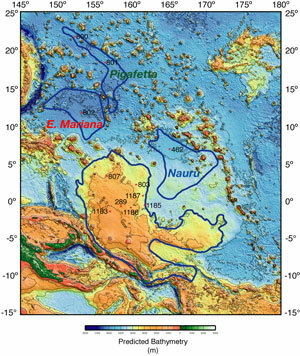 Shipley, Sequence stratigraphy, structure, and tectonic history of the southwestern Ontong Java Plateau adjacent to the North Solomon Trench and Solomon Islands arcs, J. Geophys. Res. 104 (1999) 20,449-20,466. A. Proveda, M.A. Herrera, J.L. Garcia, K. Curioca, The diameter distribution of Earth-crossing asteroids, Planet. Space Sci. 47 (1999) 679-685. M.A. Richards, R.A. Duncan, V. Courtillot, Flood basalts and hotspot tracks: plume heads and tails, Science 246 (1989) 103-107. W.P. Richardson, E.A. Okal, S. Van der Lee, Rayleigh-wave tomography of the Ontong-Java Plateau, Phys. Earth Planet. Int. 118 (2000) 29-51. P. Riisager, S. Hall, M. Antretter, X. Zhao, Paleomagnetic paleolatitude of Early Cretaceous Ontong Java Plateau basalts: implications for Pacific apparent and true polar wander, Earth Planet. Sci. Lett. 208 (2003) 235-252. J. Roberge, R.V. White, P.J. Wallace, M.F. Coffin, Anomalous subsidence of the Ontong Java Plateau (ODP Leg 192), EOS Trans. Am. Geophys. Union, 84, (46) (2003) F1490. S. Rost, Q. Williams, Seismic detection of sublithospheric plume head residue beneath the Pitcairn hot-spot chain, Earth Planet. Sci. Lett. 209 (2003) 71-83. D.T. Sandwell, W.H.F. Smith, Marine gravity anomaly from Geosat and ERS-1 satellite altimetry, J. Geophys. Res. 102 (1997) 10,039-10,054. J.J. Sepkoski, Periodicity in extinction and the problem of catastrophism in the history of life, J. Geol. Soc. London 146 (1989) 7-19. W.M. Sliter, R.M. Leckie, Cretaceous planktonic foraminifers and depositional environments from the Ontong Java Plateau with emphasis on Sites 803 and 807, in: L.W. Kroenke, W.H. Berger, T.R. Janacek, et al. (Eds. ), Proc. ODP Initial Reports 130 (1993) 63-84. W.H.F. Smith, D.T. Sandwell, Global seafloor topography from satellite altimetry and ship depth soundings, Science 277 (1997) 1956-1962. C.A. Stein, S. Stein, A model for the global variation in oceanic depth and heat flow with lithospheric age, Nature 359 (1992) 123-129. J.A. Tarduno, W.V. Sliter, L.W. Kroenke, M. Leckie, H. Mayer, J.J. Mahoney, R. Musgrave, M. Storey, E.L. Winterer, Rapid formation of Ontong Java Plateau by Aptian mantle plume volcanism, Science 254 (1991) 399-403. M.L.G. Tejada, J.J. Mahoney, C.R. Neal, R.A. Duncan, M.G. Petterson, Basement geochemistry and geochronology of Central Malaita, Solomon Islands, with implications for the origin and evolution of the Ontong Java Plateau, J. Petrol. 43 (2002) 449-484. M.L.G. Tejada, J.J. Mahoney, P.R. Castillo, S. Ingle, H.C. Sheth, D. Weis, Pin-pricking the elephant (ODP Leg 192): Pb-Sr-Hf-Nd isotopic evidence on the origin of the Ontong Java Plateau, In: Fitton, Mahoney, Wallace, Saunders (Eds.) Origin and Evolution of the Ontong Java Plateau, Geol. Soc. London Spec. Publ., 229, 133-150, 2004. P.J. Wallace, Volatiles in submarine basaltic glasses from the Northern Kerguelen Plateau (ODP Site 1140): implications for source region compositions, magmatic processes, and plateau subsidence, J. Petrol. 43 (2002) 1311-1326. Y.-S. Zhang, T. Tanimoto, High-resolution global upper mantle structure and plate tectonics, J. Geophys. Res. 98 (1993) 9793-9823.